cheap wax fix | A tight-budget collector busts cheap wax boxes. A tight-budget collector busts cheap wax boxes. This is the first in a series of three posts. 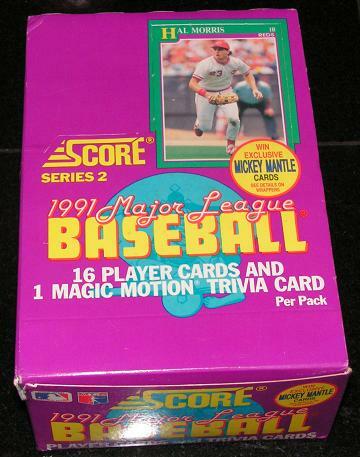 This post features three 1994 Collector’s Choice packs with NL players on the front. This post is for three different packs. Each has an Andy Warhol-esque picture of an NL star on the front. One is Deion Sanders (Atlanta Braves); another is Mike Piazza (LA Dodgers); and the last is a very svelte Barry Bonds (SF Giants). There may be other NL players on these packs, but these are the only three of which I’m aware. 117 – Ken Griffey Jr.
There’s not much to add to this post. The images pretty much speak for themselves. I’m normally not a fan of white borders on cards, but these seems to work OK. For a bottom level set for the budget collector, these cards are alright. They are nothing fancy, but of course nobody should expect them to be. Nothing wrong with that for this set. These cards didn’t fare too well since their printing nearly 20 years ago. They stuck together like crazy. A recent 1993 Upper Deck pack did the exact same thing on me, but these packs were quite a bit worse. 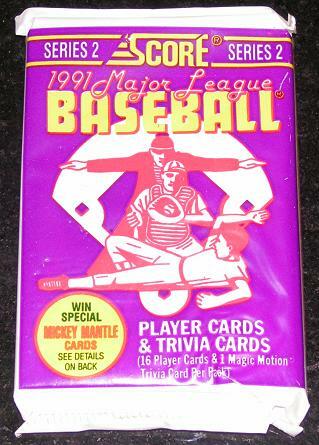 Maybe there was something about Upper Deck’s cards that made them very prone to sticking. It’s something to consider if you plan on breaking a box of this stuff and hope to find really nice cards. 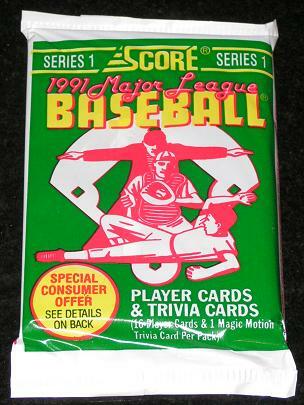 Regardless, you can’t exactly blame Upper Deck because their cards don’t store for two decades in packs. One pleasant surprise was the Gold Signature card. That is a 1:36 pack pull. Pretty good. Junk wax glory – 1991 Score. Here are both the Series 1 box and a poly pack. Green is the color for Series 1. Here are the Series 2 box and pack in a lovely purple-pink. Mantle cards – 7 cards – 1:?? Mantle Autographs – 7 cards – 1:?? I collect serial-numbered autographed and relic inserts from the 90s, and 1991 Score is ground zero for these cards. (Some might say that 1990 Upper Deck is where it all started, but I don’t collect the early Upper Deck cards for reasons I’ll cover sometime later.) The fun begins in Series 2. Series 1 is just another innocent junk product. Series 2 is where the inserts can be found. Products from the late 80s and early 90s are called junk wax for a reason. They were produced in ridiculous, almost inconceivable amounts. Exactly how much was produced of any given set is hard to calculate. To determine a print run requires one of two things. One, an estimate from the manufacturer. Or, two, both a serial-numbered card and an insertion rate. Most products from the junk wax era have neither. An exception is 1991 Donruss. In 1991 the Donruss flagship set included the Elite set. A total of 8 cards were included in the basic Elite set, and each was numbered to 10,000. Two other Elite cards, the Signature and Legend single-card sets, totaled 12,500 cards. That is a grand total of 92,500 cards in the full press run of the 1991 Elite insert set. What was the insertion rate of the Elite cards in 1991 Donruss? Well, nobody knows for sure. The figure has been estimated by the folks over at BaseballCardPedia at around 1 Elite card per 75 boxes. 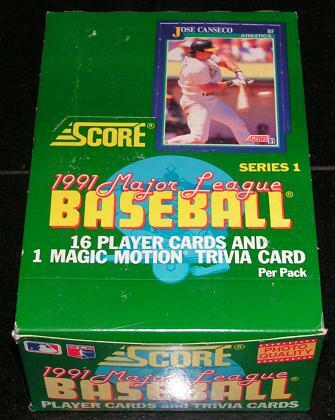 With 36 packs per box, the overall odds of finding an Elite card in a pack of 1991 Donruss is 1:2,700. Wow. Those are long odds. What does that mean for the total production of Donruss? travel between New York and San Francisco over 80 times (2,600 miles). circle the Earth at the equator almost 9 times (25,000 miles). almost reach the Moon (240,000 miles). a football field over 4,200 times (160′ x 360′). Central Park in New York City nearly 7 times (843 acres). Key West over 1.5 times (3,370 acres). The 1991 issue of Donruss had a crazy production run. That’s why you can pick up a box of this stuff for $10 or less without trying on eBay. Buy two or more boxes, and you can get the price down to $7.50 without searching too hard. This truly is junk wax. Don’t be fooled though – buying enough to get an Elite card is no picnic. Keep in mind that the least expensive Elite cards can be bought for under $10. They are numbered to 10,000 after all.